Mechanistically, viscerovisceral convergence is similar to viscerosomatic convergence. The extensive divergence of the visceral afferent fibers in the spinal cord results in primary afferents that innervate different viscera converging onto a single dorsal horn neuron (37,52-55). This may result in stimulation of two viscera exciting the same dorsal horn neuron (Fig. 4A) or stimulation of one viscus, through interneurons, inhibiting a dorsal horn neuron while stimulation of another organ excites the same neuron (Fig. 4B). Figure 4 Viscerosomatic convergence in the spinal cord. A: Two examples of excitatory viscerovisceral convergence. In (a), the cell is excited by colorectal distention and vaginal distension. In (b), the cell is excited by colorectal distention and testes compression. In both cases, the visceral afferents project in the pelvic nerve and the convergent somatic receptive field corresponds to the area expected based on the location of the neuron in the spinal cord. Source: Reprinted from Ref. (56). B: Viscerovisceral-somatic convergence producing excitation and inhibition. The neuron was excited by pinch to the chest and shoulder (a). 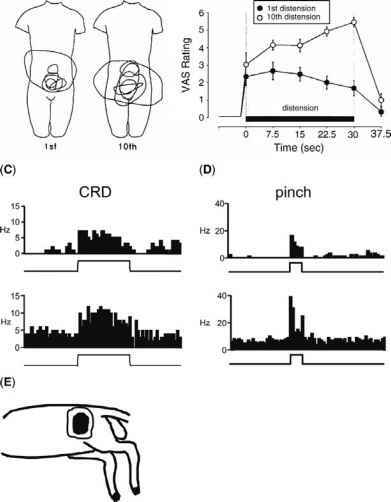 Cardiopulmonary afferent stimulation (CP in b) was excitatory, but splanchnic nerve stimulation (b) and urinary bladder stimulation (b) inhibited the neuron. This illustrates that viscera can differentially modulate dorsal horn neuronal activity in a complex pattern. Source: Reprinted from Ref. 54. Because the dorsal horn neuron cannot distinguish the source of the afferent input, there is confusion as to the site of the initial stimulus contributing to poor localization. The consequences of these viscerovisceral interactions are more profound than that of the referred somatic pain. Viscerovisceral interactions can produce inflammation in normal visceral tissue (via the dorsal root reflex) and can increase pain originating in other viscera (e.g., endometriosis increases pain from ureteral stones) (57).